Since 1917, we are Evans, Marshall & Pease, P.C. 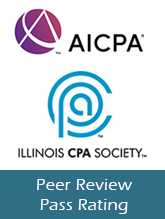 - a small professional corporation for the practice of public accounting and business consulting in Illinois. Our collective experience lets us engage in audits of businesses, local governments, and not-for-profit organizations. In addition, we are able to prepare tax returns of all kinds, as well as perform regular accounting and bookkeeping. We regularly consult with businesses in numerous industries. We take pride in our standards of quality and service. Evans, Marshall & Pease, P.C. was first licensed to practice public accounting in 1932 when laws to regulate the profession were first adopted. The firm’s original license, “Certificate Number 135”, is proudly displayed in the reception area as a reminder of the longevity of the firm’s commitment to quality and service in the business community. Our smaller size gives us a distinct advantage in serving our clients. With a smaller chain of professionals working with our clients, knowledge and experience flow more freely. Quality and service apply to the relationships we build with our clients as much as the reports that result from our engagements. We have been servicing some of our current clients exclusively for decades. To our clients, we are not “the accountants” - we are EMP.